Let’s talk… design process! In this deep dive, we will go behind the scenes of my overall design process and implementation strategy for this drug rehab podcast. 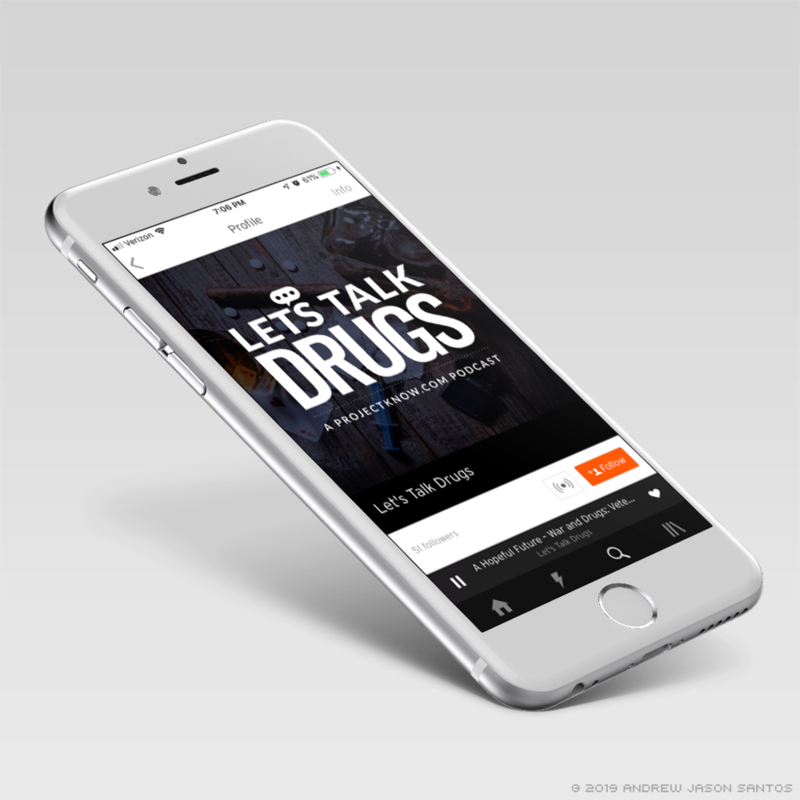 Let’s Talk Drugs is an informative drug and substance abuse education podcast, aimed at a broad, young adult audience, created in an effort to drive traffic to a number of drug rehabilitation marketing web sites, as well as various social media platforms. The show’s content centered around various topics, including demystifying various stigmas and myths, providing first hand accounts of struggles with substance abuse, showcasing the medical science behind how various drugs work, discussing drugs overall effects on current society overall as well as specialized groups, and much more, all catered to a casual, millennial audience in an approachable and conversational package. Build a new, versatile brand package around drug abuse education, to be both eye-catching and sleek, with a balanced mix of familiarity and variety. Brand and logo would need to integrate into various unique ad and content materials, with room for episode titles and other variants. Concoct a streamlined asset production system that would support output of biweekly content and marketing materials. 5 social media platforms - Youtube, Soundcloud, Facebook, Twitter, Instagram. An ever increasing number of podcast hosting sites - iTunes, Sticther, SoberNationPodcasts, Soundcloud, Youtube, Podbean, Player.fm, etc. Produce longform content UI/UX templates for embellished episode transcripts, to be hosted on the podcast parent ProjectKnow.com website. To be built and maintained in Wordpress, and available to several podcast team members for editing and publishing. Calls for custom content embellish elements, such as pullquotes, section banner images, treatment Click to Call ads, image formating, etc. The brand itself was aimed at a general Millennial Age and Younger audience, but not constricted to it. It is meant to present at somewhat serious and informative, but also modern, sleek, a bit edgy, and at times, even fun… especially when colorful episode iconography is present (See Below). The name itself it to the point and bold, somewhat in your face, but also colloquial and casual. It is meant to evoke the idea and practice of conversation, in efforts to remove topical stigma, and also to inspire inquisitiveness toward the ideas and details behind both drugs and substances themselves, as well as the behaviors and struggles of addiction, abuse, and recovery. Other considerations were the need for embedded technical variability in the branding itself, in order to have versatile assets usable for various social media content posts. The major aim of the podcast was to drive traffic back to its host website, as well as social media platforms, so all branding needed to be easily scannable and memorable. To start things off, I wanted to use the foundations I had available, which meant using some of the more solid and flexible font choices from some of the client’s catalogue of rehab web sties, leading me to both Lato and Oswald, which also are Google Fonts, making them available for use within the context of the episode transcripts hosted on the podcast’s ProjectKnow.com parent site. 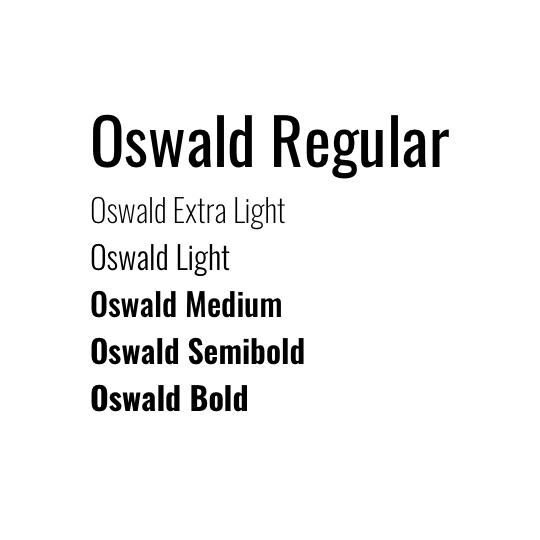 I also find that both Oswald and Lato especially have great readability at small and large sizes, and come packed with various styles and variants in their respective families, which would need to be utilized for various assets and supplemental content. As far as the design of the core logo itself, I wanted something bold, simple, to the point, and somewhat imposing, which would emphasize the title of the podcast itself, in order to make it memorable upon a glance. I also focused on the work DRUGS to really grab a casual viewers attention and pique interest. The dotted speech bubble icon was a subtle way to make the logo a bit playful, emphasize the conversational tone and structure of the show, and simply solve the balance issue of an apostrophe in “let’s” by leaning into an asymmetrical symbolic flourish. I knew that the stand alone logo would need a tagline to refer back to the host site “ProjectKnow.com” so using a font like Lato, which has flexible weights and reads well small became an even clearer choice. In other instances of the logo, especially when appearing in its extended form in episode based art, the tagline would change to episode specific titles and information. An easy and effective way to have this supplemental text live next to the main logomark was to have a subtle horizontal line separator, which I decided to make a dotted line, echoing the ellipsis in the speech bubble icon. 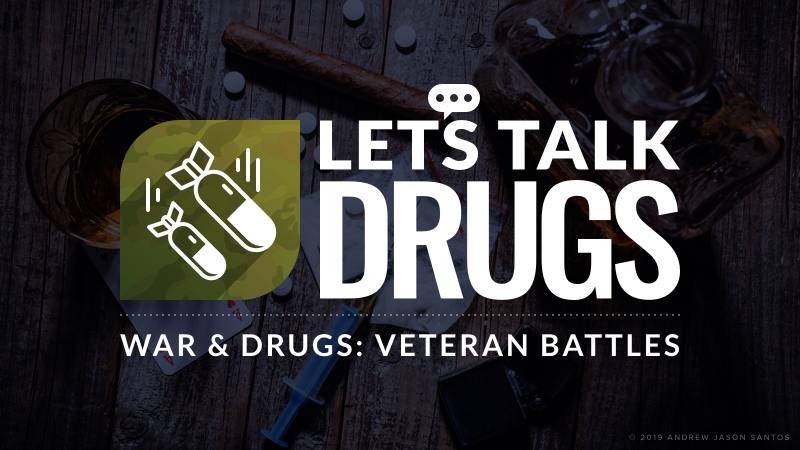 One stylized and tinted collage photograph was chosen as the main accompanying imagery to serve as a literal and symbolic backdrop to the Let’s Talk Drugs logo, which depicts several drugs and different substances, as well as addictions in general, in order to allude to the variety aspect of the show’s topics and discussions. It is a literal and figurative overview to any and all substance abuse and addiction, presented in a somewhat serious, subdued, but slightly provocative way. While the main logotype was designed intentionally to exist as monochrome, the episodic extended logos allow for each series theme to provide splashes of color and personality to the show, in a way that would enable any new content to instantly and intuitively provide diversity and freshness to the brand. Every new episode series would have a new topic, paired with a custom icon and color to be used in episode art and ads. They would be both playful and in someway allude to the the titles directly. This was a way to create manageable system of visual diversity. This area was a really fun way to keep the project fresh and interesting, as every new subject tackled would have its own splash of brand flavor meant to both have symbolic meaning tied to the theme, and also add some fun and brevity to heavier topics through color and style. A major focus for the podcast was experimenting with various social media platforms, as a means to both build and bolster a new brand, as well as to help direct traffic back to the podcast’s host website, leading users to various other content and CTA opportunities. Advertisement graphics were intentional simple, colorful, modern, slightly subversive and mysterious, and a bit more fun than the actual subject matter at hand, all intended to stand out in any scroll of visual content a user might be thumbing through on their devices. Through frequent and regular social media posts, supported by a consistent marketing asset production schedule and system, notable gains were achieved where they hadn’t existed prior, all while also providing a new kind of valuable, informational stream of content to our vast user base. 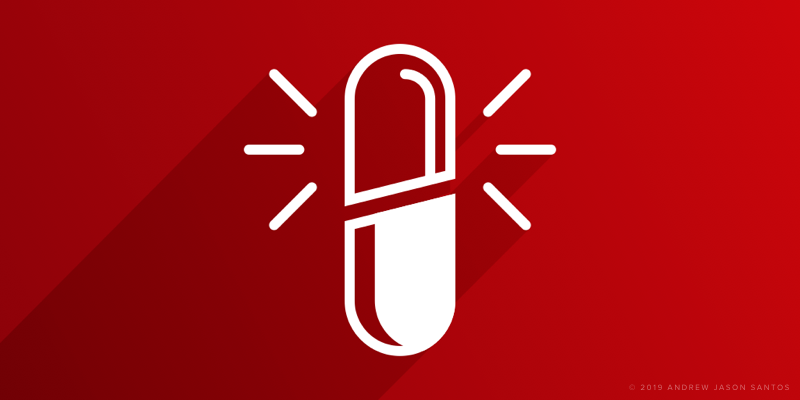 Along with each audio episode, a custom formatted transcript page was required, which housed live links to other content, as well as numerous Calls to Action links and ads to various substance abuse helplines. These pages existed in various formats over the course of my involvement, but mainly were my own brew of custom coded pages managed through Wordpress. Due to limited resources, a significant amount of my own time had to go into building and editing code snippets to support special handling of text, image, and interactive elements of the transcript pages. I did devise various production systems to help make this process a bit more sustainable and lower maintenance, but it still paled in comparison to a fully integrated Wordpress editable template. This lead to some varying results to the content over time, eventually loosing imagery and custom text elements for a more text based, streamlined minimal take. Links to CTAs and other content were still present, but overall it was deemed more valuable to not invest extra time into design. Part of the approach to the podcast was to both bring traffic to the main host website, in order to funnel users to various treatment CTAs and other info, as well as to turn them back out to our growing social media presence across various platforms. This meant that content had to have value wherever it was consumed, either with special visual care given on placed like Facebook or Youtube, or with custom decorative formatting to our own transcript pages on the host website. Either way, we aimed to ensure some visual value across the board, to keep users engaged, but ready to click through to the next experience. Overall, the project was a sleeper success, mostly due to a low risk, strategic investment effort on the creative side, as a result of meticulous planning and efficient production system building. As a result of this, the podcast was able to steadily grow through frequent and repeated regular social media marketing tactics, as well as natural SEO traction, and some word of mouth. Over the year the podcast began in which I was heavily involved with its visual production, it only grew and never stagnated too long, ever trending positive. The brand itself was also well received and deemed a good match for the target demographics. One lesson, or, portion of the project that I would maybe tackle differently, would be to find more temptable ways to advertise the podcast itself on various platforms, through video, animation, or custom graphics, but the resources allotted to the project simply did not permit this. On a more managerial-success note, my weekly routine involved set periods in which I could conceive and execute new series theme graphics, and then produce the various promotional assets, all in one go. I could tackle the various episode transcript pages, filling them with supplemental visuals and text styling, on a schedule I helped set with the audio production members, all in line with my ready to go content publishing pipelines. This was only one of many other creative efforts I was involved in at any given time at this organization, and without a strict and manageable production process, many resources would have been wasted and time would have been sunk into reinventing the wheel for each new series ideation. Careful but flexible UI/UX systems can go a long way in the name of value efficiency and return on investment, which is my default approach on these kinds of ongoing production endeavors. I am forever a strong advocate of the idea that “Efficiency can be FUN!” and this project now helps provide practical evidence of that success.